So today, in honour our new assistant coach who has her Masters in Biomechanics. I've decided I would try and impress her and post part of a project I did on the biomechanics of a deceptive backhand crosscourt drive/flick. 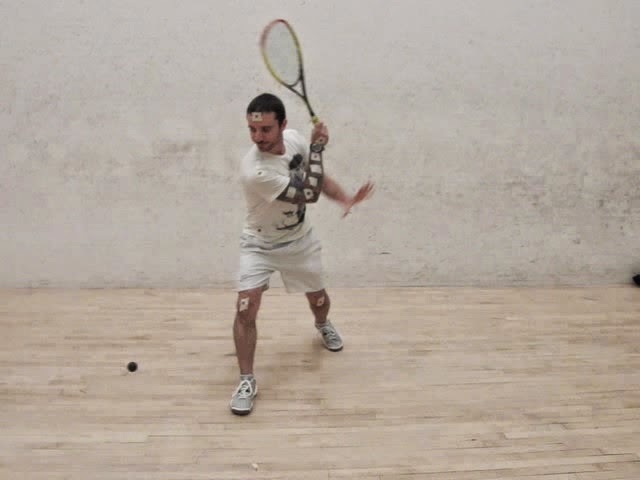 I filmed myself hitting a regular attacking backhand straight drive and one where I used a late rapid wrist acceleration to flick the ball crosscourt. I took a look at how similar the swings looked frame by frame. This is a lot of work to do, but is an excellent way for professional players to learn how well they are coupling 2 or more shots from a single swing. Maybe you feel that you are being deceptive and setting up the same way but something (a tell) is giving away that you are about to hit one shot or another. Here are my my still frames breaking down the backhand deceptive crosscourt length flick. I wore the tape so it would be easier to track my joints and the angle and the velocity that they moved during the swing. I also filmed myself hitting this shot from the sagittal view (behind me). Which you have to remember is where you're opponent is going to be viewing from the T. The view above provided measurements for how much various joints moved forwards but would not be the best angle for how similar my deceptive crosscourt looked to my regular straight drive. I also filmed myself hitting a regular drive and compared them frame by frame to pick up subtle difference. I haven't posted these as this post will be long enough. I will however get into what I think it important to perform this skill well. For those that are interested in the biomechanics, here is a chart of what is important during each phase of the swing. There are a number of essential elements required for an expert performance of a backhand deceptive crosscourt from the front left position of the court. The following are the most crucial components for expert performance. 1. 'Disguise/Deception': The first and most crucial element for effective performance is having a shot body/postural setup that is identical to a straight drive. This means that the performers hips should be perpendicular to the front wall. The shoulders and the feet must also be perpendicular to the front wall, which is how a person would set up to execute a traditional straight drive. If this criteria is not met it is unlikely that the opponent will be expecting a straight drive (and less likely to be deceived). The following mechanical factors are required for effective execution of a deceptive backhand crosscourt flick. 2. 'Power Load' – timing of the heal-toe step and elbow (hyper)flexion: Besides the postural setup, the synchronicity of the downswing, and the transition stage is an important element for deception. If the swing starts too early the opponent can read that the racquet will contact the ball too far to the right of the athlete and too far in front of their front foot which reveals that the shot will be hit crosscourt. So just having a proper postural setup is not sufficient for effective deception. One particular stage of this timing sequence appears to be interconnected. This is the heal-toe step of the right (front) foot and the commencement of the wrist flexion and elbow extension. These are closely linked in time and are the most immediate motions prior to the onset of the racquet downswing. The close connection between the two allow for the effective buildup (torque) and transfer of force along the biomechanical kinetic link. 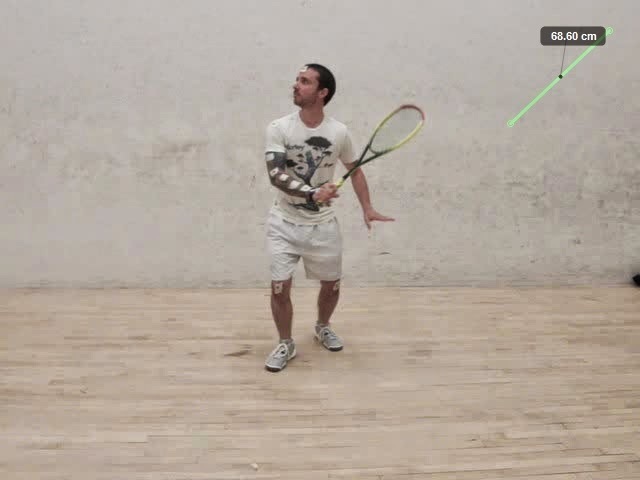 The front foot heal touches the floor first and as the toe follows suit the elbow and shoulder of the racquet arm begin their final bit of rotation before starting to unwind into the downswing. 3. 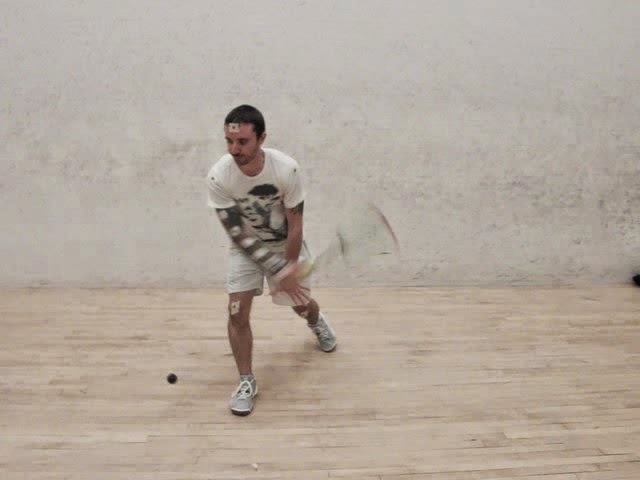 'Shoulder Torque': Another important element for successful deception is the relative angle of the racquet-hand shoulder from the transitioning downswing through the downswing and to the contact point. Just prior to the downswing the medial rotation of the shoulder is fully rotated to provide maximum torque. Early and excessive lateral rotation of the shoulder(s) will reveal your true shot intention and timing. This has a lot to do with the angle of the step the athlete takes stepping into their shot. If the direction of the lead foot step is towards the front wall (versus the side wall) it will once again be more obvious what the true intention of the shot will be before it has been hit. The shoulder torque is an important part of producing the torque required for generating maximal amount of force and should not be what determines the location of the shot execution. It is the wrist and elbow extension acceleration that makes the shot deceptive. 4. 'Level-Headed': The position and lack of rotation of the neck and head are also vital for successful performance. The head begins higher, but as the performer steps into and lowers their centre of gravity, the head lowers but remains parallel to the floor through the downswing and contact of the ball. The head also rotates laterally slowly through the shot. The head gives a general frame of reference to where the athlete is looking and focusing their attention. In a traditional crosscourt by an amateur player, the head and neck will open up towards the front wall, towards the direction of the shot. In an expert performance of the deceptive backhand crosscourt, the forehead and neck remain perpendicular to the front wall through the downswing and the contact point. Because the head is a revealing postural cue for shot selection it is important to eliminate lateral rotation. The head and neck can also be used in facilitating deceptive shots, for examples in 'head-fakes' when rotating the neck in one direction while hitting it to another. 5. 'Rapid Wrist Acceleration: The Snap': None of the previous elements are sufficient on their own for successful performance unless the athlete can generate a wrist acceleration during the downswing to make the racquet head to increase in velocity to hit the ball in front of their lead foot. This rapid acceleration of the wrist is done through extension and supination. 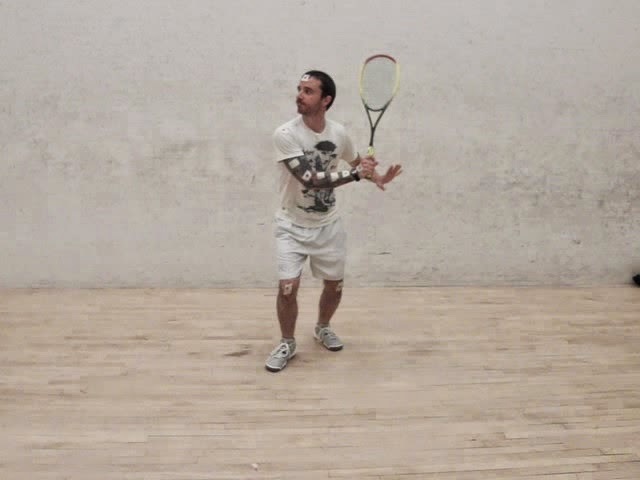 This requires a lot of strength in the wrist and forearm, especially if the ball is cold. From a traditional perspective, this rapid acceleration is done after the onset of the downswing and because of the this the beginning of the shot looks as though it will be hit straight down the wall. The flick crosscourt still needs to be struck with a sufficient amount of pace and accuracy to be effective. This wrist extension increases the angular velocity of the swing and means that the ball is hit with the wrist extended. 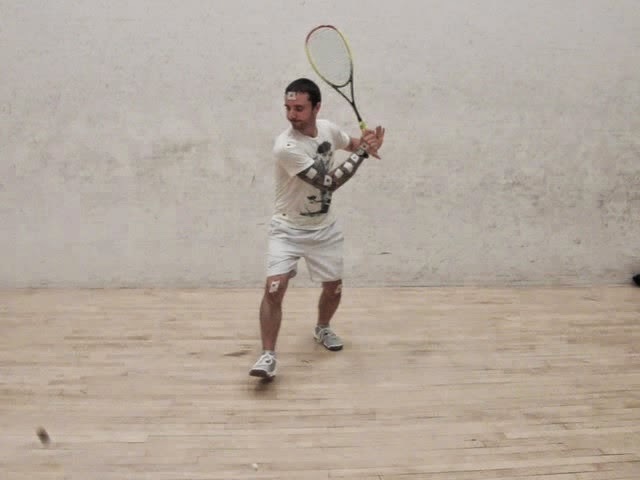 The end result of a successful performance in the shot being struck slightly ahead of the lead foot with an angled racquet face striking the ball crosscourt. 'Other/Tactical Implications': The position of the performer on the court and the time allowed to execute the setup and shot will influence the effectiveness of the shot. So the successful execution of this skill not only requires the proper sequencing and timing, but also an understanding of when to play this shot and how much time is required to execute the skill effectively. Here is a checklist for each phase. I've listed what is critical to coupling your regular backhand straight drive and deceptive backhand crosscourt drive. Snap: rapid wrist extension must occur to increase the velocity of the swing so the racquet face is angled appropriately for a crosscourt. Meaning that the wrist must be in extension at the point of contact so the racquet head is not parallel to the forearm. I have a lot more info where this came from. I also have some slow motion videos from this, but they were too large to upload to my blog. If I can compress them somehow I will upload them at another time. 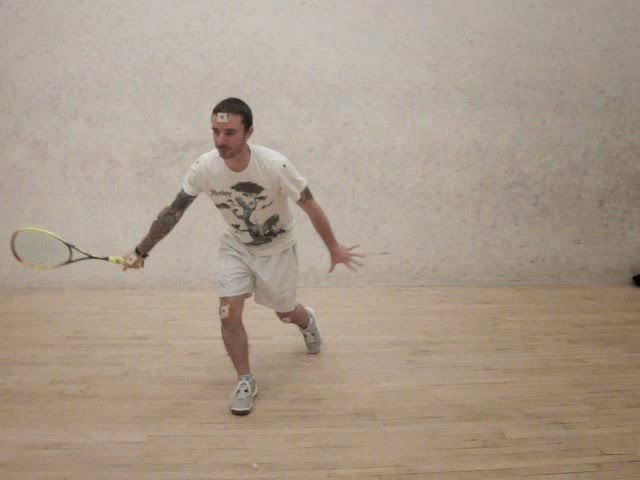 I hope that this was interesting to some of you and gets you thinking about the physiology and biomechanics involved in not just these two shots, but in squash.